By Air: (Ciampino or Fiumicino Leonardo da Vinci) From Ciampino we suggest you take the Terravision shuttle bus which runs frequently from Ciampino to Termini and drops you off on Via Marsala i.e. the far side of the Station from where you can find the Residenza Monti. 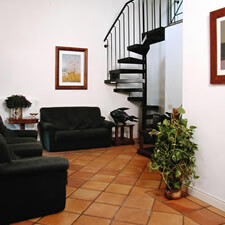 Simply walk inside the Station and take the Metro Line B in the direction of Laurentina (you also go this way if you are going to the EUR business district of Rome) Get off at Cavour (first stop) and walk the short distance i.e. down via Cavour past the Hotel Palatino and turn right into via dei Serpenti. By Train: (Termini train station) The main railway station Termini which is also the airport terminal for Ciampino (Terravision Shuttle Bus( and Fiumicino (Leonardo Express Train) is located only 350 metres away making the Residenza Monti a superb choice for your accommodation requirements in Rome. 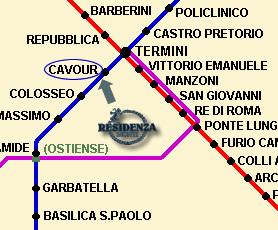 Upon arrival at Termini take Metro Line B 1 stop to Cavour. Upon exiting the Metro Stop Cavour (turn left at the the top of the first flight of stairs, Cross the busy road at the zebra crossing and go left, walk down Via Cavour for 100 metres past the hotel Palatino and take the first right at the junction. This is via dei Serpenti, proceed to number 15 and you have arrived.